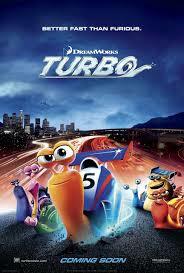 Turbo is a movie about a snail who dreams of racing in the Indianapolis 500, and that totally works out for him. But, hey, a snail racing in the Indianapolis 500 is the premise, and this is an animated movie, so whatever. Unfortunately, the wonky premise is actually one of the better parts. Theo (Ryan Reynolds), or Turbo as he will eventually rechristen himself, is a snail who lives in a garage where he watches old tapes of car races during the night, while working a shift as a garden snail on a tomato plant by day. This sequence bugged me to no end; yes, the entire premise is wonky, but at least makes for some great visuals near the end. The beginning, where natural snail activities are treated as a kind of weird job, makes no sense and is also boring as all get out. Turbo has the crappy job of sorting the rotten tomatoes, so I guess we’re supposed to feel sorry for him – except he’s a snail, he doesn’t have a job; there’s really nothing stopping him from eating the tomatoes he wants to eat, or doing anything else, for that matter, because he’s a snail. Snails pretending to have jobs bugged me worse than Turbo essentially being doused in nitrous oxide and gaining car-based superpowers. One is necessary for the story; the other isn’t. Anyway, Turbo’s newfound powers cause a workplace accident which get him and his brother, Chet (Paul Giamatti, Hollywood’s go to “we’ve got a tough premise to sell here, can you sell it?” guy), fired; essentially condemning them to death, since this isn’t unemployment as much as “no food for you”. Chet was a workaholic, and is not happy with Turbo; his job is to constantly remind everyone this is a movie with a dumb premise. A taco stand owner finds the pair, and enters them into a snail race with the other business owners of a failing strip mall. These include Ken Jeong as a short, female nail salon owner; that should tell you a lot about this movie right there. (I’m also trying to formulate a joke referencing snails being hermaphrodites, and failing, and that should tell you a lot about this reviewer.) Of course, Turbo blows the other snails away (including Samuel L. Jackson), and the scheme to enter a snail in the Indy 500 is born. So, everyone heads off to Indiana, where Turbo is entered as a racer. When a video of him racing goes viral, everyone decides a snail racing in the Indy 500 would be a great stunt. Turbo gets to meet his racing idol, a French Canadian driver (Bill Hader) who needlessly morphs into a villain during the actual race. It’s always the racer with the non-American accent who does that. Despite none of this making any sense, the race is the best part of the movie; it’s at least fun to watch. This is a scene that only really works in animation. Luckily, Turbo’s powers leave a giant neon blue streak behind him, so we can see where the snail is in comparison to the cars. Though the race animations were rather good, the character designs were rather simplistic; Epic’s gastropod designs were much more detailed, and much more interesting. Also, some of the backgrounds seemed lacking for a DreamWorks Animation picture. I did not see this movie in 3D; I did not even have the option to see it in 3D. Despite my local theatre being completely capable of playing a movie this way, and Turbo being still in its first week, they apparently just gave up on it. Jeffrey Katzenberg would be disappointed. This movie is pretty bad; the beginning is boring and bland in a way that points up the sheer stupidity of the setting. The second half is better if you can go with the premise; otherwise, it’s also pretty stupid. This is clearer than NPR's rambling "consideration", a better summary of the plot, and incorporates on-site reporting. Nicely done.